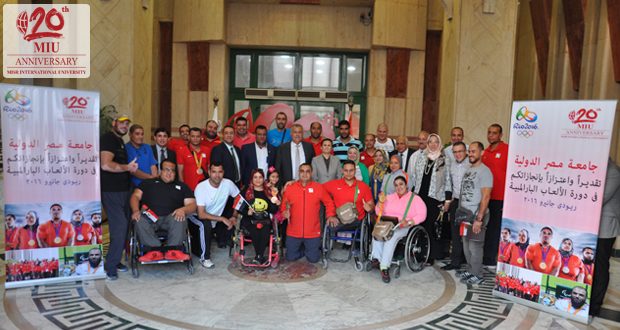 Misr International University organized a celebration ceremony for the Paralympic games’ winners who represented Egypt in Rio 2016 Paralympics on Wednesday October 19, 2016 in the OOA Hall at 3 pm. The Board of Trustees Chairman, Mr. Mohamed El Rashidy, the University President, Prof. Dr. Mohamed Shebl El Komy and the Vice President Board of Trustees, Prof. Dr. Farida El Rashidy honored the winners for their outstanding achievements in the tournament. 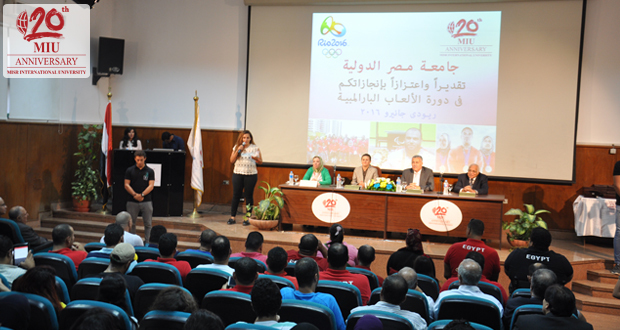 The ceremony was attended by MIU faculty deans, department heads, staff and a large number of students from all faculties who wanted to express their pride and share the moment with the Paralympic winners. Furthermore, Misr International University honored Prof. Dr. Hayat Khattab for her dedication and national achievements. University President Prof. Dr. Mohamed Shebl El Komy awarded her with the university shield in appreciation of her efforts. 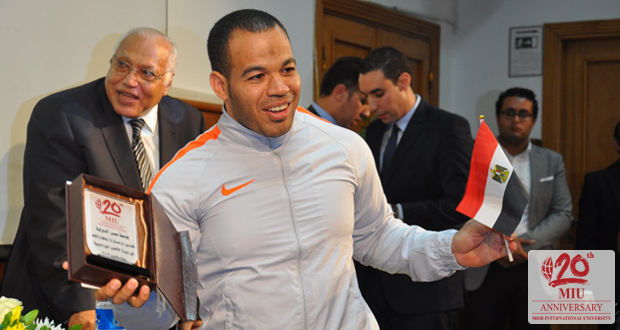 The gold medal winners for powerlifting are Shereif Khalifa, Mohamed El Deeb and Randa Mahmoud. While the silver medal winners for powerlifting are Rehab Radwan, Fatma Mohamed, Mohamed Ahmed and Amr Farouk and Mostafa Ali for athletics. Finally, the bronze medal winners for powerlifting are Shaaban El-Dosouky, Amal Hanafy and Amany El-Desouky. The Men’s sitting volleyball team has also won a bronze medal.